As a decorator, I’m often asked, “Where do I even begin?” when clients want to redecorate. Whether you’re doing a full-blown transformation, or you simply want to refresh the look and feel of a space, I always advise starting with your area rug. Area rugs come in an abundance (some might argue an over-abundance) of colors, patterns, styles, and textures, so choosing the one that speaks to you most is crucial in building a space around it where you’ll feel at-home. With more and more people becoming practiced in fine-tuning their eyes on design, whether that’s through watching design-themed TV shows or getting swallowed-up in Pinterest, we’re seeing an emergence of decorating trends that focus on individuality, warmth, quality, and color. With this in mind, selecting an area rug that not only fits the vibe of your home but that also suits your unique style, taste, and lifestyle is the first step in building a space that will feel remarkably yours. When decorating, why buy the rug first? First, rugs typically contain a multitude of colors. If you can pull out one to three colors that you love from the rug, then matching your furniture (as well as smaller decor and accessories) to the specific colors used in the rug will be a lot easier to do than buying all of your decor and accessories first and then trying to find a rug that matches. Second, you’ll want to make sure the pattern is one that you can decorate around. Rugs with a prominent Southwestern theme, for instance, are typically busy and should be accented with calming, natural textures such as wood and leather. These tend to coordinate nicely with minimalist decor and desert tones such as rust, peach, tan, warm white, sage greens, and pops of black (imagine a photo of Moab, Utah, with its richly colored arches, soft green cacti, and dark, shadowy crevasses). Third, and finally, you’ll want to think about how much action and use this rug is going to get. Unless you enjoy replacing your rugs frequently or having them professionally cleaned quite often, I wouldn’t recommend buying a rug with a white base to use in a room that gets a lot of foot traffic. If you wanted to use a rug with a white base in, say, a guest bedroom, though, then that could totally work! 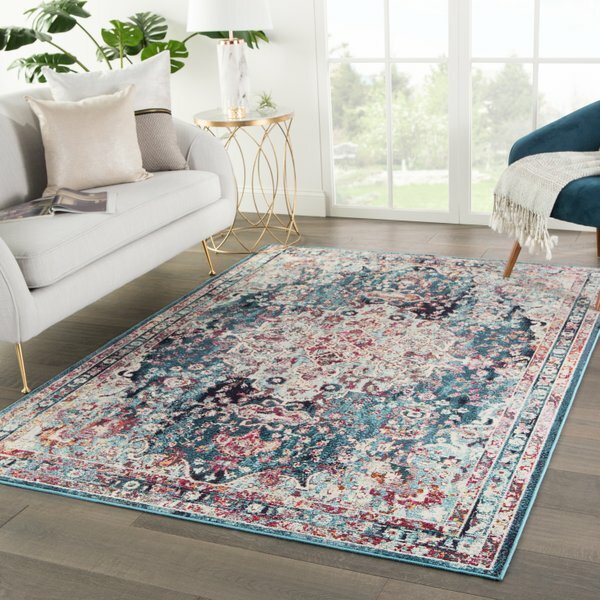 After exploring the ins and outs of Wovenly’s site in pursuit of a rug that would refresh my own living room, I was impressed by not only the variety of style and color options, but also by the affordable costs for what appear to be super high-quality area rugs! The materials in some of my favorite rugs range from the more economic polypropylene and cotton, to the very durable and eco-friendly jute, and even include high-end materials such as silk and wool. Wovenly also offers quite a large selection of hand-woven, hand-tufted, and hand-knotted rugs at very reasonable prices, especially when compared to similar quality rugs I’ve shopped for among other sites. Are you a fan of buttery caramel-colored leather furniture? Think of its light orange hue, and how you might be able to balance that out in your space using a deep teal-based area rug and decor accents. Orange and teal are opposite each other on the color wheel, so by combining these two colors in your space, you create a calming sense of balance. On the other hand, if your sofa is a very cool pale grey color, you’ll want an area rug with rich, warm hues such as burgundy, rust, magenta, or even mustard or burnt orange to establish cozy harmony. Image by Pia Ulin via Remodelista author Margot Guralnick, April 1, 2016. What sort of space are you decorating? Have fun with this and go all-out when choosing the perfect rug. We’ve all seen the same white and black, “modern farmhouse,” grid-like-patterned rug used time and time again in beautifully decorated rooms on Pinterest. Does that mean this is the rug you should get when decorating, say, your tween daughter’s new bedroom? Nope! If I had a daughter, or a client with one whose room needed a refresh, THIS is the rug I would choose for her space: the Marley Boho/Bohemian Medallion Rectangle Area Rug. I love that it feels whimsical, with pops of turquoise and yellow, yet it’s also dark and mature, with deep teal and scarlet serving as base colors that a young girl can grow up with. I’d pull one or two colors from it when choosing bedding, curtains, and fun decor accents for a bedroom that features this rug. As I mentioned before, unless you’re someone who enjoys buying new area rugs (hey, some people do!) or who doesn’t mind having your rugs professionally cleaned regularly, you should avoid placing a predominantly white or very light-colored area rug in a high-traffic space. We have an ivory jute rug in our loft hangout, but this space is upstairs in our house, just outside of the bedrooms. By the time people get this far into our home, they already have their shoes off, or they’ve just woken up and are likely wearing slippers or cozy socks, so this rug rarely sees the sole of a shoe, and it’s not likely to get dirty. On the other hand, rugs in the main living or family room might not have that same luxury. Let’s face it: not all guests are “we take our shoes off indoors” kinds of people. It’s also sometimes awkward to ask everyone to remove their shoes when they’re visiting for a more formal party (I mean, the shoes are part of the outfit at that point, #amiright?!). Consider a rug that either has a busy pattern or lots of pigment for areas with high traffic, and save the more delicate-looking, paler rugs for spaces that don’t see as many feet, such as a guest bedroom, formal living space, or your home office. For instance, if you have dark floors and your decorating scheme is begging for a light-colored area rug, I’d recommend you use something like this Travertine Modern Abstract Rectangle Area Rug from Wovenly for high-traffic spaces because it’s light in color, yet still has a busy pattern that can camouflage dirt or smudges. Then, you could use a more formal, less busy rug such as the Fitz Modern Geometric Rectangle Area Rug, pictured below, in an office or formal living room. I always tell my clients, “This is your home, so if the look I put together for you isn’t speaking your language, then you have every right to switch it up!” Of course, I do put a ton of consideration into each client’s decorating plan, and I always try to work-in some of the environmental factors surrounding the client’s home so that the overall vibe doesn’t feel out of place. For city dwellers, I tend to go more contemporary or mid century modern (check out Wovenly’s “Eames” rug); for people in rural neighborhoods, I go more modern-farmhouse or rustic; for clients who live in the mountains (I’m based in Denver, Colorado), I aim for a cozy mountain lodge feel; and for those a little more isolated in the desert areas, I shoot for a bit of a southwestern flair. E-styling clients who live in coastal areas usually receive from me a recommendation to layer a cool-toned rug over a larger natural fiber rug (jute and sisal are great for layering!). With all that said, a really awesome Persian or Moroccan rug, such as Wovenly’s Gibraltar Traditional Oriental Rectangle Area Rug, can look incredible with many of these themes if the colors are right! In the world of decorating and design, contrast is key. When every element of a styling plan is matchy-matchy, the space ends up losing character and its sense of identity. Mix up some of your decor elements by bringing in a variety of textures. Wovenly sells a unique set of hand-woven and hand-knotted rugs, which are characterized by their flat weave (very low or no pile), natural fibers such as silk and wool (which are also very durable), and their bumpy texture, usually with fringed edges, too! These are great stand-alone rugs, but also look super cozy when layered over a jute or sisal area rug. I love the subtle pattern and the chunky texture of Wovenly’s Mesa rug. In my home, we’ve layered a faux cowhide rug over a hand-knotted rug, and the effect is warm and rustic, without looking cluttered. Even if you have carpet, you can use a jute rug to ground all the furniture in a room. The juxtaposition of textures adds character to the space while bringing everything together in an intentional way. On another note, if your space is very modern or contemporary (lots of clean lines, smooth surfaces, and blunt colors), soften it up with a high-pile shag rug, or perhaps a soft, polypropylene rug with faded colors and a vintage pattern. Whatever your decorating style, be sure to consider these factors before choosing your next area rug. Also, take a good few hours to do your research and find the right rug at the right price, beginning with your search at Wovenly.com.